Senator Kamala Harris (D-CA) officially announced her bid for president Monday morning, simultaneously releasing a campaign video on her Twitter account while detailing her 2020 plans on Good Morning America. 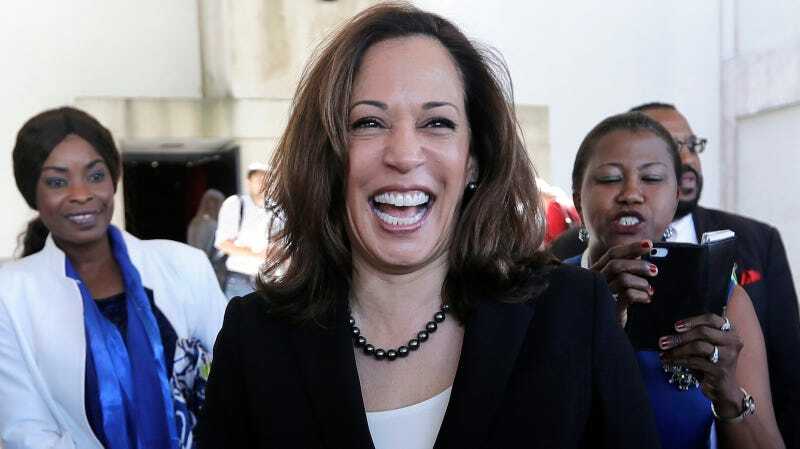 The clip emphasized Harris’s campaign slogan—Kamala Harris for the People—and the “values we as Americans cherish,” including but not limited to “truth” and “decency,” a positive message that also alludes to the sitting president, no doubt an early unifying strategy. Sen. Harris’s bid was symbolically announced on Martin Luther King Day, but also had a deeper significance: 47 years ago this week, Shirley Chisholm became the first black person and first woman to run for President in a major party, and Harris’s campaign visuals consciously paid homage to that, sharing the same red and yellow color scheme as Chisholm’s presidential buttons. “I am the candidate of the people of America,” Chisholm famously announced on January 25, 1972, signifying a populist and unifying approach to a campaign in a country that, still reeling from two assassinations and racked by the Vietnam War, a desperately needed it. Harris, with her “For the People” slogan, recognizes a parallel moment of crisis, but is also approaching her run with her typically pragmatic will to fight. On Good Morning America, she emphasized her “sense of responsibility to stand up and fight for the best of who we are” and “until recently, our moral authority in this world, and our ability to work with our allies.” Harris also spoke about her connection to the work of Dr. King—how her parents met in the Civil Rights movement, and what his sense of justice represents to her as a prosecutor. Who Is Kamala Harris&apos;s New Memoir for? Harris’s first campaign stop is January 27 in her hometown of Oakland, and her campaign will be headquartered there and in Baltimore, per CNN. She joins an already crowded 2020 Democratic primary that also includes Sen. Elizabeth Warren, Sen. Kirsten Gillibrand, Rep. Tulsi Gabbard, Julián Castro, probably Bernie Sanders and Joe Biden and Cory Booker and Michael Bloomberg, a handful of unlikely minor contenders and, likely, 45-50 other people we haven’t yet considered.